Here is a list of retail discounts for seniors and baby boomers, updated for 2018. Some of these discounts begin as early as age 50. Proudly whip out that driver’s license and pay less than that youngster behind you in line. Many senior discounts are offered by franchise owners and some choose not to participate in certain promotions. Senior discounts can vary by location and can change at any time. Contact the store to verify the promotion to eliminate disappointment or frustration. We try to stay current on the most popular senior discounts that are widely available. We rely on our savvy readers to help us to keep this list as up-to-date as possible so please leave a comment whenever you have an update to share. Are you one of those people who are too embarrassed to ask for a senior discount? Please tell me “NO!” or I will have to whack you with my cane. Go get that discount and keep more money in your pocket! Be sure and share this with other savvy seniors who love to save! Banana Republic – 10% discount off the entire purchase including sale items for those 62+, (65+ in Canada) in stores only and cannot be combined with other discounts. The senior discount can be combined with any Banana Republic rewards you may have and you can use your Banana Republic credit card to additional benefits. Although I could not locate a link to the Banana Republic senior discount on their website, I called customer service and the senior discount policy was read to me over the phone. I was told the Banana Republic discount does not extend to Old Navy or GAP stores. Bealls – Shoppers 50+ receive 15% off every Tuesday. Bealls Outlet Stores are located in Florida, Georgia, and Arizona and this chain also operates as Burkes Outlet in several southern states. The outlet stores and Burkes stores offer a senior retail discount of 15% off every Monday to shoppers 50+. Belk – enjoy exclusive in-store savings to customers who are 55 or older on Senior Day, the first Tuesday of the month. 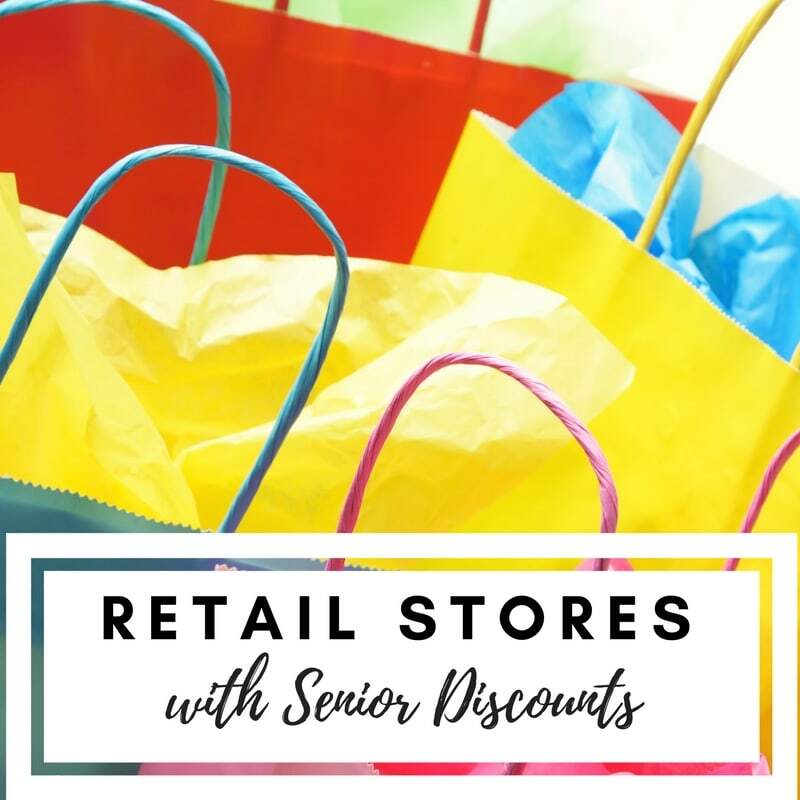 BonTon Department Stores – Many locations have a senior day where those 55+ can get 15% off purchases, but check before you visit. Burkes Outlet– offers 50% off entire purchases every Monday for customers who are 50 years of age or older. Customers must sign up for a free loyalty one card to receive the discount. C.J. Banks/Christopher & Banks – 10% discount on Wednesday for those 60+ on full-priced clothing and accessories sold in-store. Double check with your local store to insure participation. Dress Barn – receive a 10% discount if you’re 65+, but the day of the week for the discount will vary by location which is usually Tuesday or Wednesday. Check your local store for the day they participate. Family Dollar – offers exclusive savings on select items to AARP members who swipe their card at check-out. Contact your local store to insure participation. Goodwill – shoppers 55+ receive 10% off purchases, but many locations only honor this discount one day a week. Check with your local Goodwill store for their senior discount policy. Joann Fabric-offers a 20% in-store discount every day of the week to customers who are 55 or older. Valid photo identification must be presented at check-out. Kohls: Every Wednesday, customers who are 60 or older a 15% discount on in-store purchases. Michael’s – If you are age 55 years or older, take 10% off your entire purchase including sale items every day. Simply present a valid ID at the register. Some exclusions apply. See Store Team Member for details. Available in store only. Ross Stores– those 55+ receive 10% off on Tuesdays when you join their Every Tuesday club. Sign up at customer service and show your ID and the store will issue you a senior discount card. Salvation Army Thrift Stores – discount varies from 15-50% off your purchase for those 55+. Check with your local Salvation Army store for their senior discount policy. Stein Mart –shoppers 55+ with ID receive discounts on the first Monday of each month. Visit the Stein Mart website for Senior Day coupons. Offers vary by month. Keep your money saving tips coming for all of us to share! Do you know of any other stores that offer retail discounts to seniors! Retail Discounts for Seniors & Boomers first appeared on More With Less Today. The Beall’s stores near me (Central Florida) offer their Senior Discount on Tuesdays.